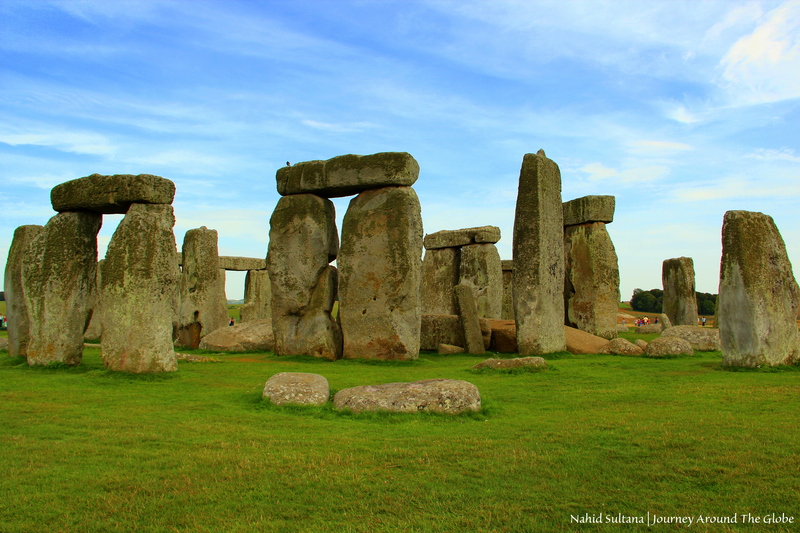 STONEHENGE and BATH, ENGLAND: Both of these places were on our to-see list for a long time. Last time we were in England in August of 2012, we couldn’t manage leaving London and visiting other places, because London itself is too much to handle at first visit. So this time we came to the great country of England and squeezed some awesome places to visit during our stay. Stonehenge is an ancient miracle that has been standing on its current spot for the past 5000 years or so. It is indeed a place to visit in England and go “wow” how is it even possible. From Stonehenge our next spot was the ancient Roman city of Bath. Located by River Avon, the Georgian City of Bath is a wonderful place to visit with many fine buildings, riverside walk, small squares, and of course the Roman Baths. Bath is the birthplace of famous writer from the 18th century Jane Austen (of Pride and Prejudice and many other). Situated 100 miles from London, it’s a gorgeous city mainly famous for its hot springs, medieval heritage, and Georgian architecture. It’s the oldest town in England that has been attracting tourist for many centuries. No wonder the whole city is listed as a UNESCO World Heritage Site. TIME of TRAVEL: We took a cruise to the Baltic Sea on the 1st week of August 2013. The cruise started from Dover and we were back in the port of Dover after 12 days. This gave us a wonderful opportunity to add some extra days to our vacation and roam around this part of England. We stayed in Cheltenham in a friend’s house. Good thing we had our car with us. We drove to Stonehenge and Bath the day after we docked at Dover port. It was a nice day overall, may be little rain while driving…otherwise, a good day for tourism. 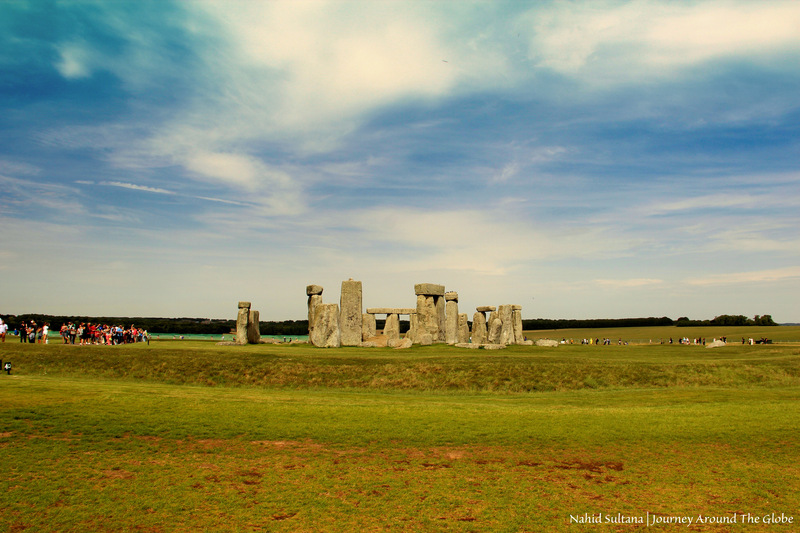 EATING and SHOPPING: Stonehenge has no real restaurant once you are inside its perimeter. There are few snacks and sandwich places with a big souvenir shop. The place is trying to add some more facilities for its tourists, may be in the future people will have more options for meal and shopping. I saw many families bringing their own lunch from outside or home and enjoying them in the parking lot in the back of their cars. Bath definitely has lot more options when it comes to eating and shopping. Of course it’s relatively a bigger city and more spread out. 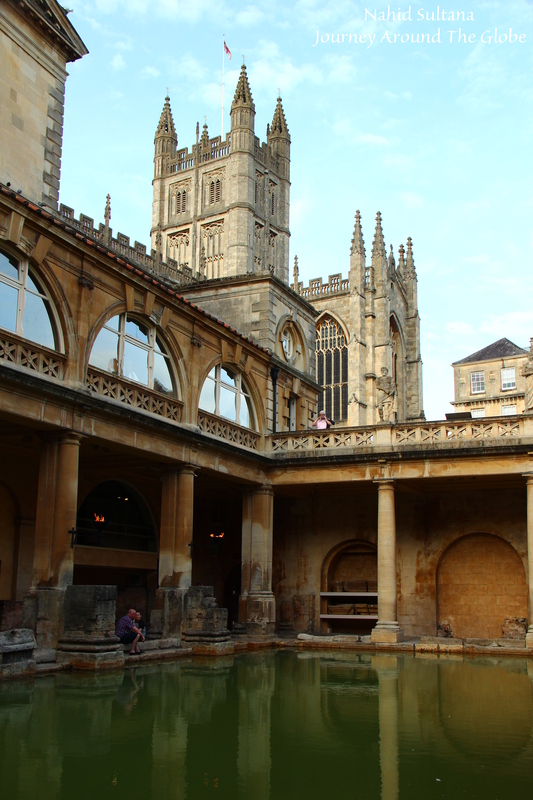 There are many cafes and shops in the same square where Roman Baths and Bath Abbey are located. Some of these stores sell products hand-made in Bath…may be some exclusive and expensive stuff. 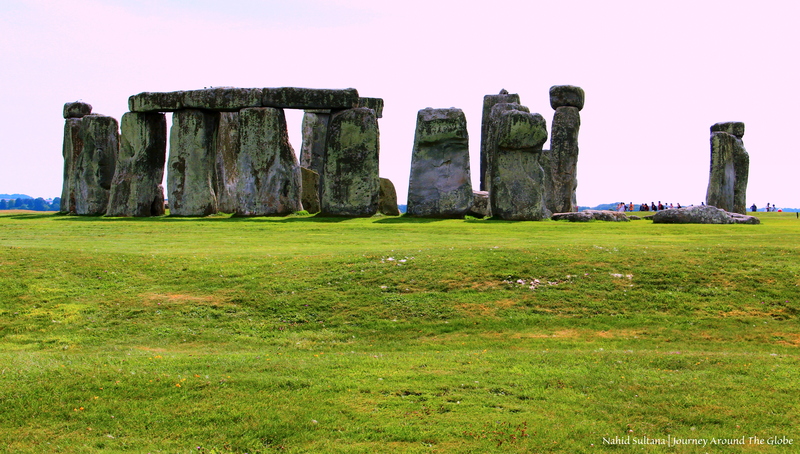 PLACES WE’VE VISITED: We visited Stonehenge and Bath on same day. Started with Stonehenge first and reached Bath in late afternoon. 1) STONEHENGE: The ancient stone circle of Stonehenge, means “Hanging Stones”, is an exceptional survival from a prehistoric culture who lived here 5000 years ago, making it older than the pyramids in Egypt. We could actually see the standing stones from highway while making our way to get there. This Bronze Age monument wasn’t built all at once; it’s a creation by generation and generation of people. Built between 3000 B.C. and 1600 B.C., the exact purpose of this monument still remains a mystery. It is aligned with the midsummer sunrise and midwinter sunset. Some say it was a temple to worship, some say a place for celebration, while some say an ancient observatory, and in others opinion it was a burial site. The giant block of stones those are standing there are from Wales, about 250 km away. So, the question that archeologists still ask is that how they brought the stones all the way from Wales and how they made them stand up right. The heaviest stone is about 45 tons. Half of the original ring of Stonehenge structure till remains for our and future generation to see. Some of the stone fell off, some were taken away as souvenirs, and some were just stolen for other purposes. A ditch surrounding the site, that we still can see, was dug by hands using bones. Stonehenge was abandoned after 1500 years of built. Now, this It is a UNESCO World Heritage Site and part of English Heritage. 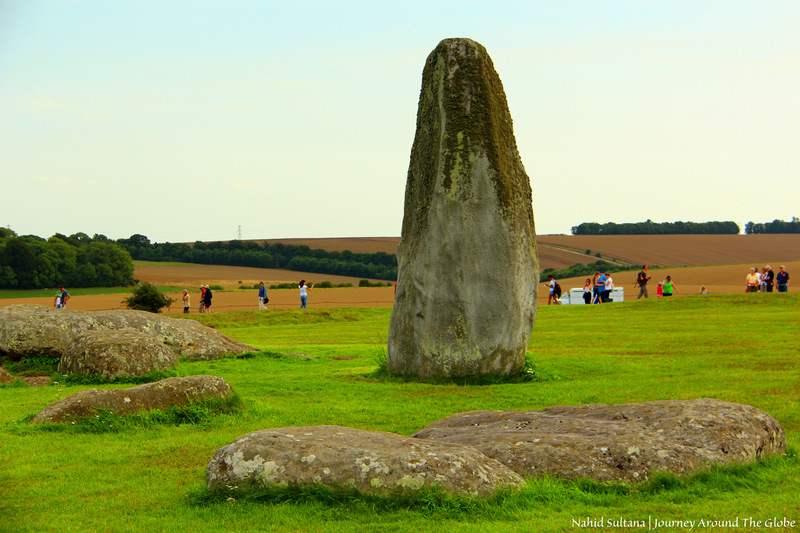 Other than Stonehenge there are few other scattered structures and stones in this place which are also enlisted in WHS. Other than this, there are few more outstanding ancient structures and monument that can be reached on foot from here. The main area of the site is fairly level and fenced. Tourist can enjoy the view from a distance and can’t get too close to the stones. Stonehenge ground is open daily except for Christmas Eve and Christmas Day. It’s 8 GBP per adult and 20.80 GBP per family with 2 adults and 3 kids. Ticket includes an excellent audio tour of this place. New facilities for visitors were under development during out visit. 2) BATH: We only had little more than 2 hours to spend in Bath after visiting Stonehenge. Drive between these two places were about 45 minutes to an hour. If you get a chance, try to get a view of Bath from up above….it’s absolutely beautiful with many old grand architectures on rolling grassy hills. 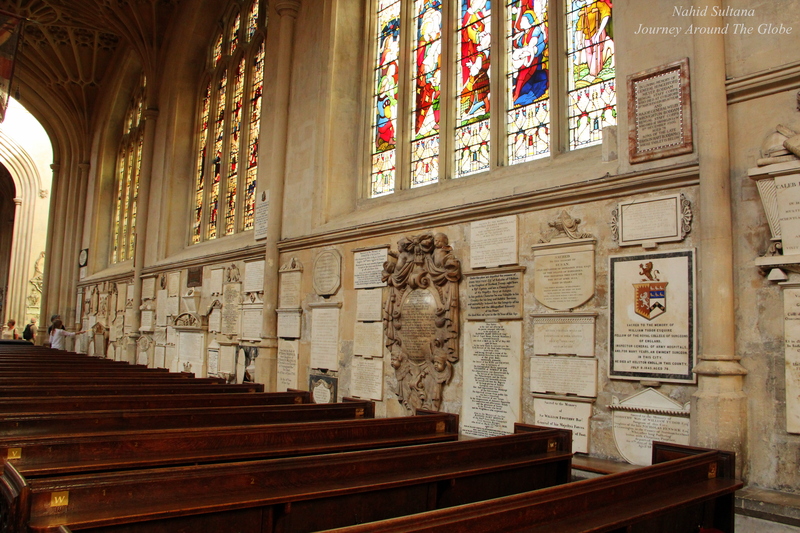 a) BATH ABBEY: This beautiful building has been standing on this spot since the time of the Saxons. The present façade was built on the ruins of a former Norman cathedral in 1499 and is a fine example of English Perpendicular architecture. This is the last Gothic church in England. It was somewhat destroyed in 1942 during WWII and was opened recently to the public in 2000. This parish church boasts a fine collection of Saxon and Norman stonework on its walls. Stained glass windows at the East End contains 56 scenes from the life of Jesus. Don’t miss the statue in one side of the abbey “The Lady With The Pitcher”. The abbey is located next to Roman Baths in the center of the city. It is open Monday – Saturday from 9 – 6 and there is no fee to enter. 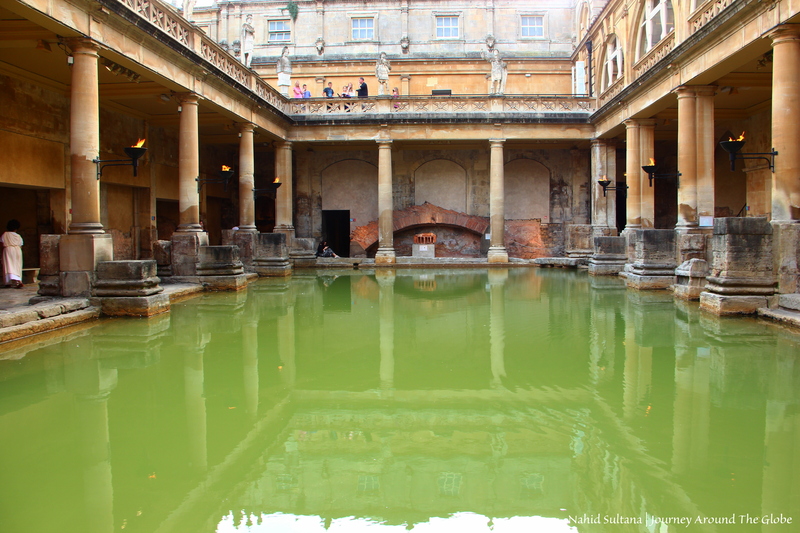 b) ROMAN BATHS: This is the finest and best preserved ancient baths and temple complex in northern Europe that is still flowing natural hot water. It’s a UNESCO World Heritage Site and the main attraction of Bath. It’s the only hot springs in the UK. 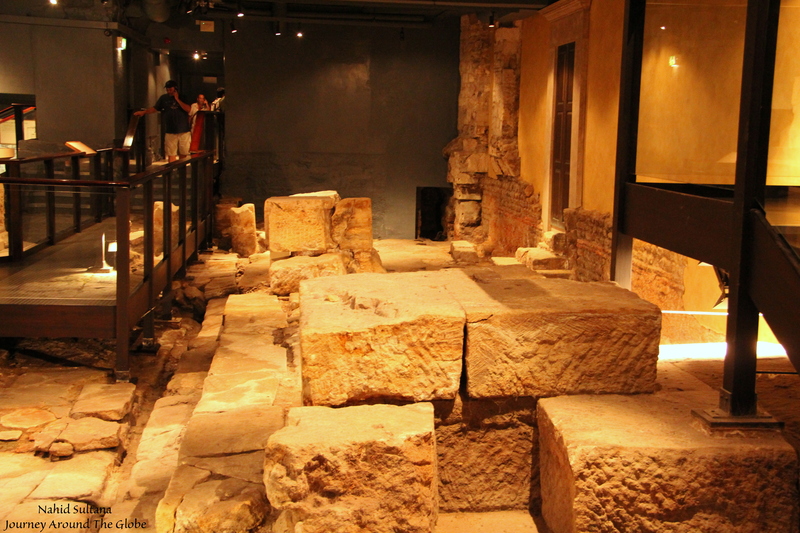 Though no longer in use, visitors can get a glimpse of past Roman life and people of Aquae Sulis (old Roman name of Bath) in the small museum in the lower level. Thanks for a good maintenance that we could walk where Romans once walked, on ancient stone pavements around the steaming pool. The hot water in the springs rises about 46 degree C each day and supplies 1.25 million liters of water a day. 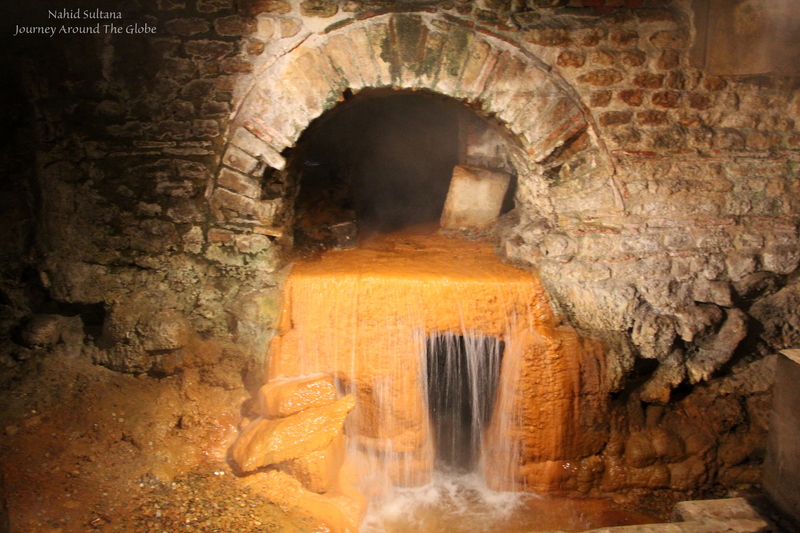 Roman engineers built a reservoir to supply this hot water to the baths. 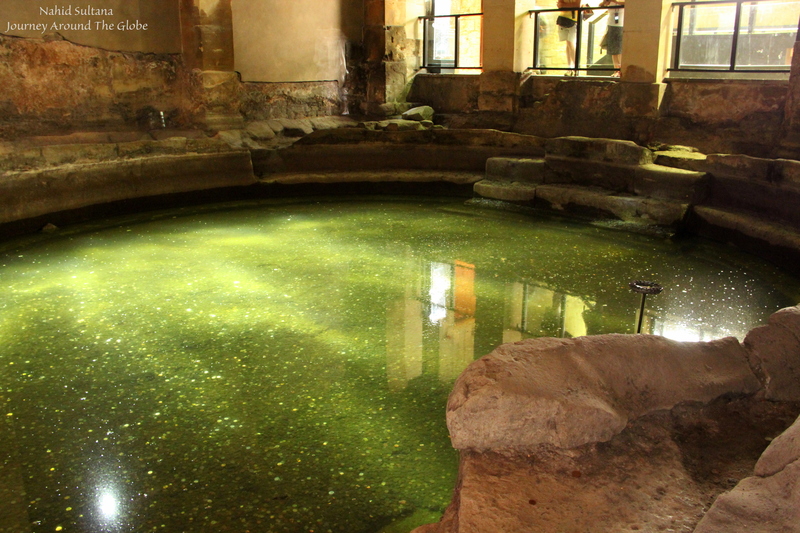 The first baths and temple buildings around the main spring were completed by 2000 years ago in 76 AD. There are 2 levels to see here. Upper level has a terrace (from 1897) with a nice view of the Great Bath. Lower level is where we spent most of the time enjoying natural spring, Roman ruins, ancient temple courtyard, Gorgon’s head from the temple pediment, spring overflow and drain, Great Bath, couple smaller indoor Roman baths, and a museum with findings from the Roman town including carvings and inscriptions from the temple buildings. Romans built the extensive baths and a major temple complex around the hot spring. 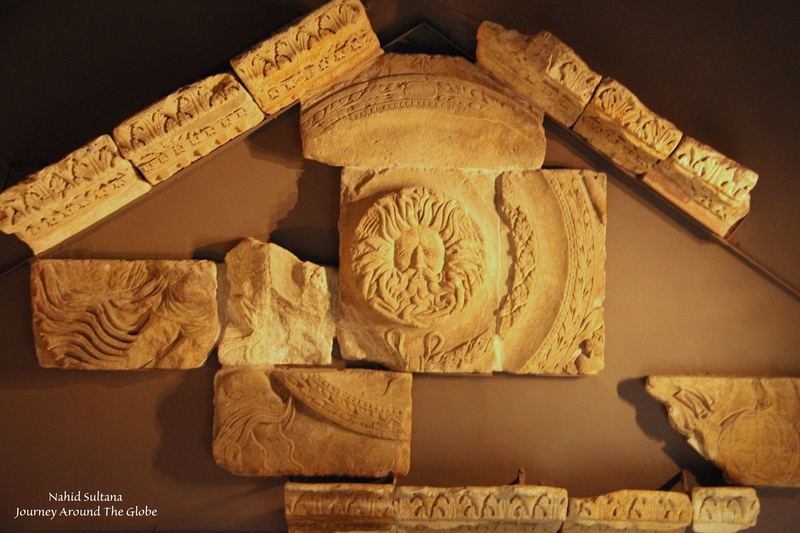 This was one of the tallest buildings in Roman Britain with roof 20 meters above the bath. At the end of the tour make sure to get a taste of natural “Bath” water from the restaurant for free with your ticket. It’s open daily from 9 am to 10 pm with last entry at 9 pm. Ticket is 13.25 GBP per visitor above 17 years and 36 GBP for a family of 2 adults and up to 4 kids. It’s located right beside Bath Abbey with a great view of its tower from the lower level. 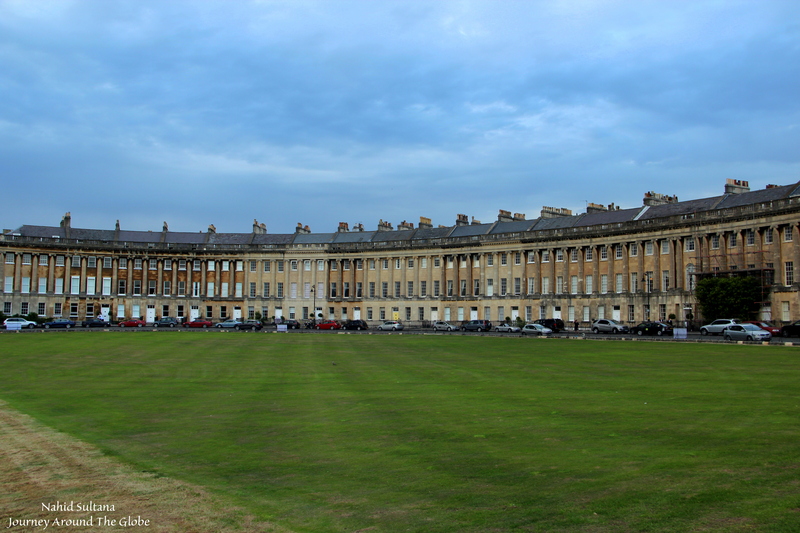 c) ROYAL CRESCENT: This magnificent semi-elliptical crescent of houses is supposed to be the most photographed building in Bath which was built in the second half of the 18th century. This is the first of the eighth original crescents of Bath. We didn’t have time to go inside but tourist can go inside its museum to see what it would have been like living in these houses at the end of 18th century. My grandmother was a parlour maid in one of the Crescent houses when she was a young girl. All I can remember her saying is it was for a “literary gentleman”, so I am guessing a writer of the time. She remembered being promoted from scullery maid to the much coveted elevation of parlour maid as something she was very proud of. This would have been back in the late 1800’s. wow, thanks for the story…love personal stories related to these historic landmarks.